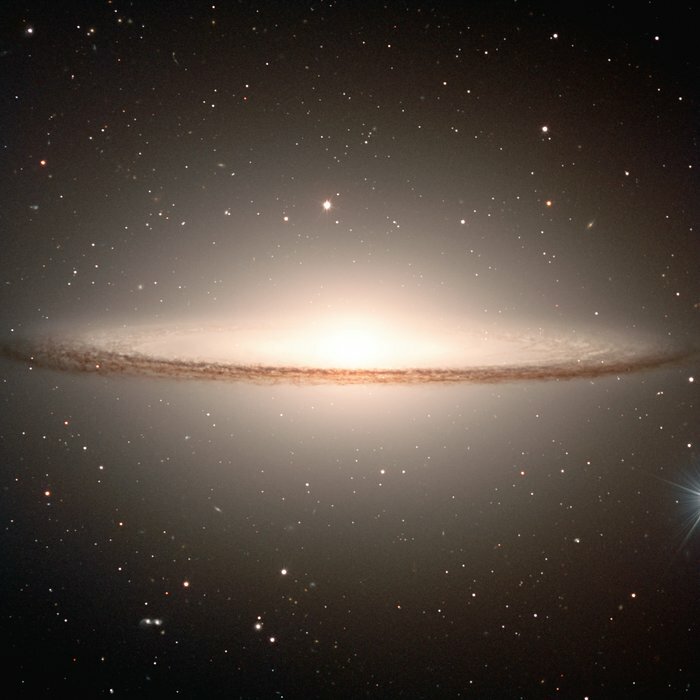 Image of the famous early-type spiral galaxy Messier 104, widely known as the "Sombrero" (the Mexican hat) because of its particular shape. 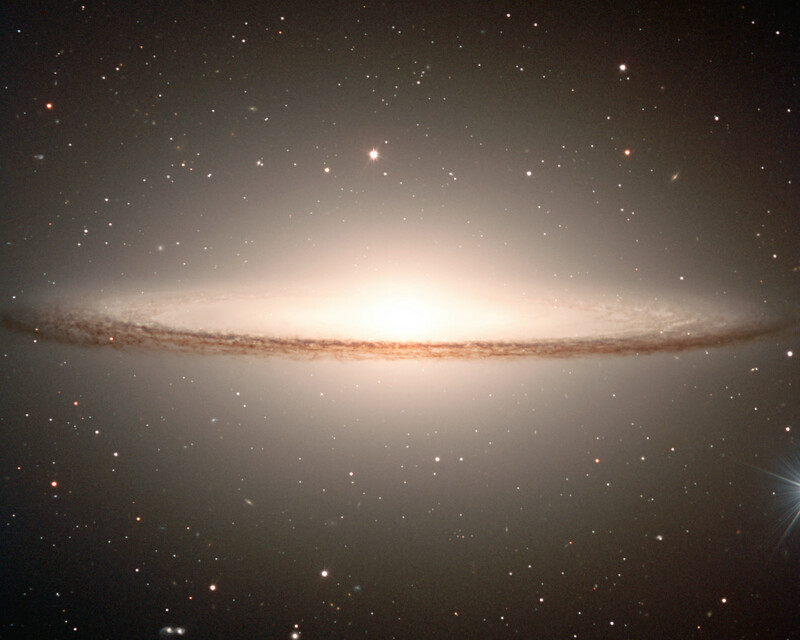 The "Sombrero" is located in the constellation Virgo (The Virgin), at a distance of about 50 million light-years. 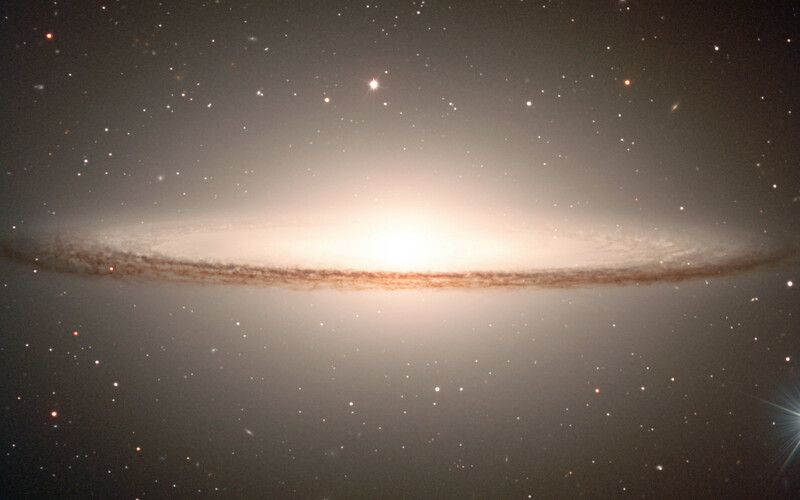 Messier 104 is the 104th object in the famous catalogue of nebulae by French astronomer Charles Messier (1730 - 1817). It was not included in the first two editions (with 45 objects in 1774; 103 in 1781), but Messier soon thereafter added it by hand in his personal copy as a "very faint nebula". The recession velocity, about 1000 km/sec, was first measured by American astronomer Vesto M. Slipher at the Lowell Observatory in 1912; he was also the first to detect the galaxy's rotation. This galaxy is notable for its dominant nuclear bulge, composed primarily of mature stars, and its nearly edge-on disc composed of stars, gas, and intricately structured dust. The complexity of this dust, and the high resolution of this image, is most apparent directly in front of the bright nucleus, but is also very evident as dark absorbing lanes throughout the disc. A significant fraction of the galaxy disc is even visible on the far side of the source, despite its massive bulge. 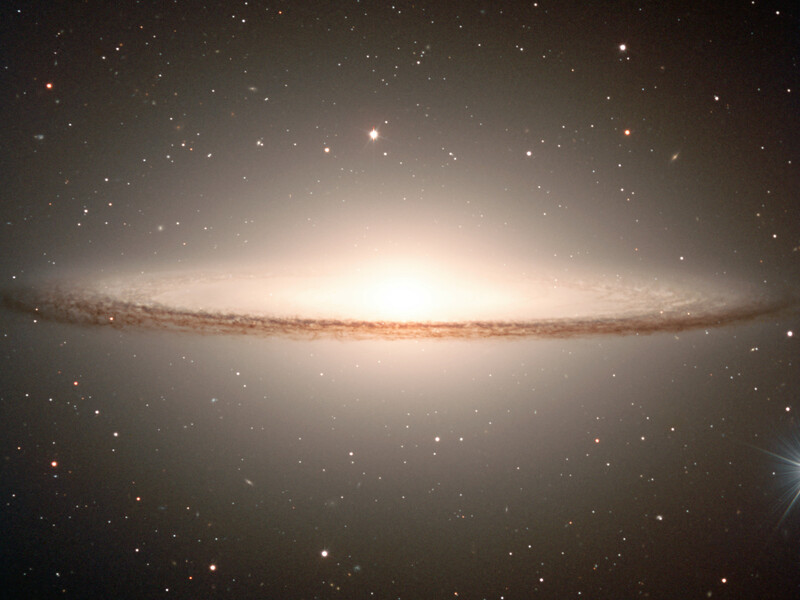 This picture was obtained with FORS1 multi-mode instrument at VLT ANTU on January 30, 2000. It is a composite of three exposures in different wavebands. North is up and East is left. Technical information : This composite image is based on three exposures from the FORS1 instrument at VLT ANTU. They were obtained at about 6:20 hrs UT on January 30, 2000, through V-band (central wavelength 554 nm; 112 nm Full Width Half Maximum (FWHM); exposure time 120 sec; here rendered as blue), R-band (657 nm; 150 nm FWHM; 120 sec; green) and I-band (768 nm; 138 nm FWHM, 240 sec; red). The seeing was 0.6–0.7 arcseconds. Acknowledgments: Mark Neeser (Kapteyn Institute, Groningen) and Richard Hook (ST/ECF, Garching, Germany). Position (Dec): -11° 37' 23.21"